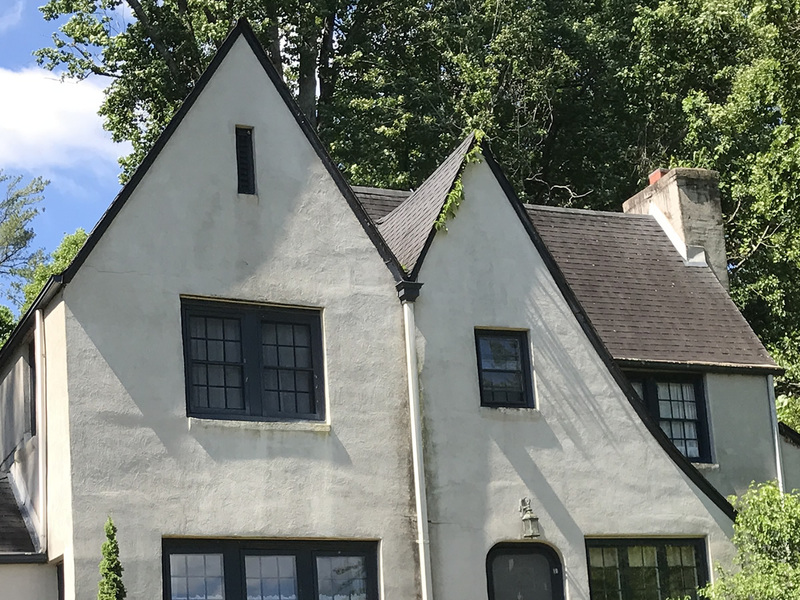 There are two Tudor Revival houses in Druid Hills. They seem to look alike, but they’re really not. The G. Florence Boyle House is on Meadowbrook Terrace. The Campbell L. Boyd House is at the corner where Clairmont Drive meets Orleans Avenue. 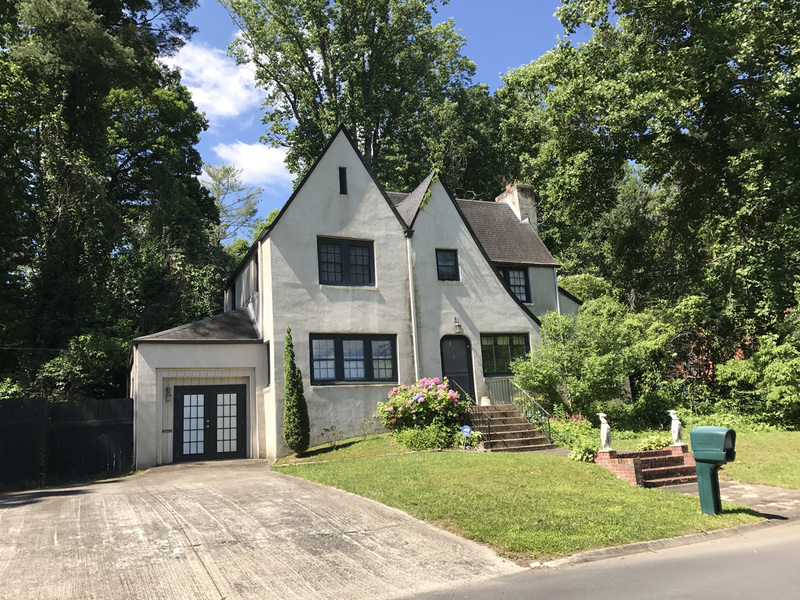 Two Tudor Revival houses in Druid Hills. Both houses were built during the period of greatest development in Druid Hills, from 1923 to 1926, during Hendersonville’s real estate boom. The early houses were not little. Early deeds included the restriction that no residence could be built for a cost less than $4,000. The G. Florence Boyle House, on Meadowbrook Terrace, is two-story, set back among trees. It has a side gable roof parallel to the street and a steep sweeping roof on the front. The opening for the front door has curved arch on top. 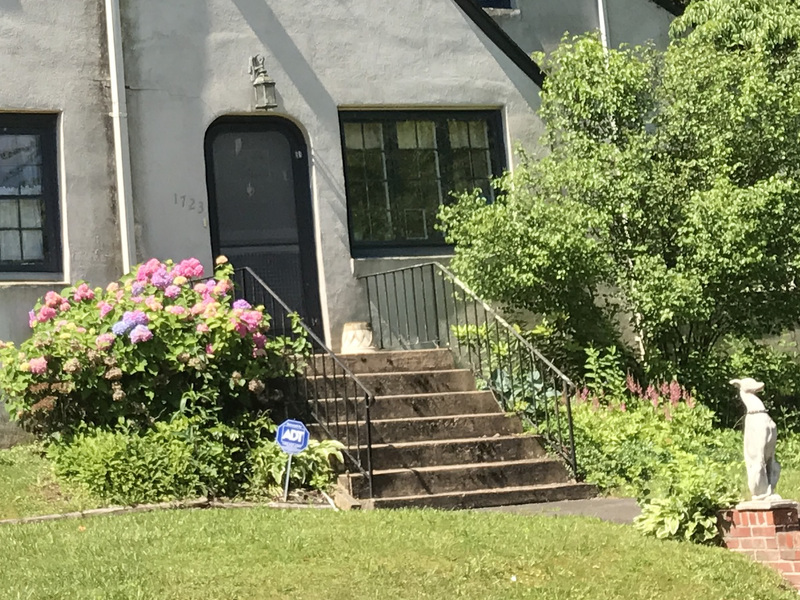 The opening for the front door has curved arch on top, but not as curved as the front door on the Campbell L. Boyd House. 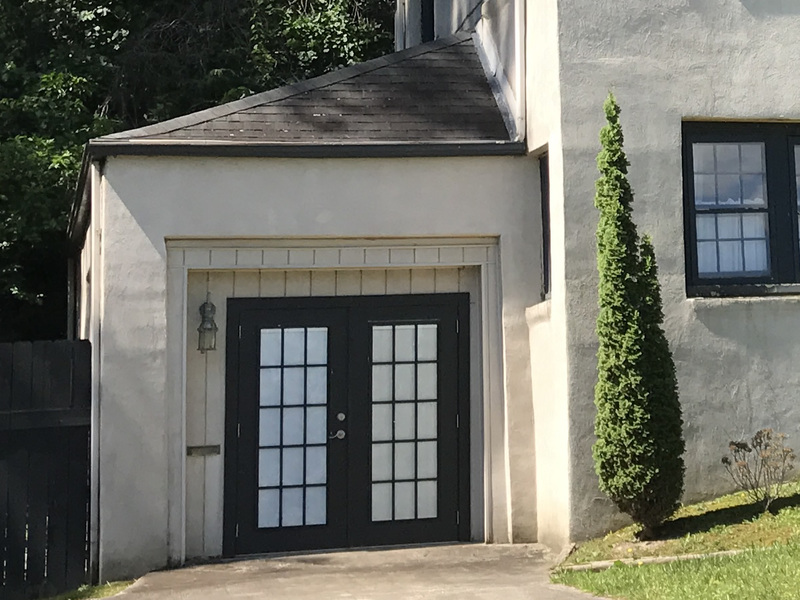 On the left, the French doors lead to a garage, finished into a room. In the original plan, a large area north of Meadowbrook Terrace was designed as a park with pathways, an amphitheater, and a tennis court. The G. Florence Boyle house would have been close to the park. But, in 1926 the land was re-platted. “The plan for the park was changed to individual house lots with what appears to be a linear green space down the middle.” I think this is the vacant land behind the houses on the west side of Arlington Place. When I first moved here, it was a shallow pond. Now it’s just a field with occasional muddy spots. So, who was G. Florence Boyle? I really can’t find much. Was she the first owner of the house? Millers’s Cleaners used to make City Directories for Hendersonville each year. The 1939/1940 and 1941/1942 directories list Boyle, Florence Mrs. and Boyle, H Perry, student, as residents of 1723 Meadowbrook Terrace. Widow? Single mom? Perry could be a girl’s name or a boy’s name. James Dawson Sloan was born March 6, 1907. His father, Harry Augustus Sloan, died in 1942, the year the James moved to Druid Hills. He married Lillie Mae Thomas and they had 2 children. They lost their infant son in 1944. He was buried in Oakdale Cemetery. Their daughter, Patricia Sloan Pace, gave them three grandchildren, then ten great-grandchildren. James Dawson Sloan was a manager at Duke Power Company. Duke Power started in 1904, providing electricity to Victoria Cotton Mills in York County, South Carolina, near Rock Hill. In 1927, they purchased the Blue Ridge Power and Light Company, a hydroelectric company. Their dam on Green River created Lake Summit in Tuxedo. Early power was usually for mills and factories. At first, residential electricity was only available if you lived near a mill. Later, if you lived close to a power line going to a mill, you could request to buy electricity. But after World War II there was a real demand for residential power. Everyone wanted a refrigerator, electric stove, even a television. So, James Sloan was a manager during the boom in electric demand. James Dawson Sloan died in 1996. Lillie Mae Thomas Sloan died in 2007. Her obituary describes her as an avid gardener. By this time, there was a large family of descendants living in this area. James and Lillie are buried together at Shepherd Memorial Park in Naples, Henderson County.